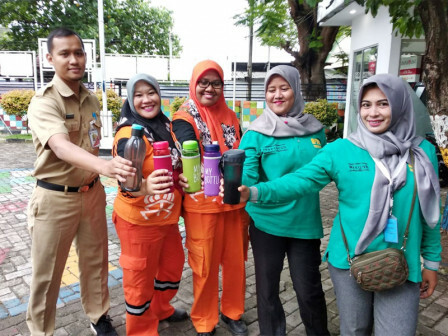 The Tidung Island, South Thousand Islands is launching a movement to reduce garbage plastic which is by bringing your own bottles.
" This movement is able to reduce garbage plastic"
"This movement is able to reduce garbage plastic," expressed Tidung Island Urban Village Head, Cecep Suryadi, Tuesday (2/12). Besides for long term, it also aims to welcome the assessment of the Hatinya PKK at national level. In other words, every day, PPSU officers and RPTRA managers must make ecobrick for every person, so there will be 73 ecobrick collected every day. To reduce garbage plastic and implement the My Island with Zero Garbage and My Beautiful Island Without Garbage Plastic, his side obligates 67 officers of PPSU, 6 managers of RPTRA, and 13 employees of ASN to bring their own tumbler drink and do not use a water bottle that leaves garbage. "We start from ourselves, hopefully it will be an example for our citizens," he said.